The sun defies conventional scientific understanding. Its upper atmosphere, known as the corona, is many millions of degrees hotter than its surface. Astrophysicists are keen to learn why the corona is so hot, and scientists at the U.S. Department of Energy's (DOE) Princeton Plasma Physics Laboratory (PPPL) have completed research that may advance the search. 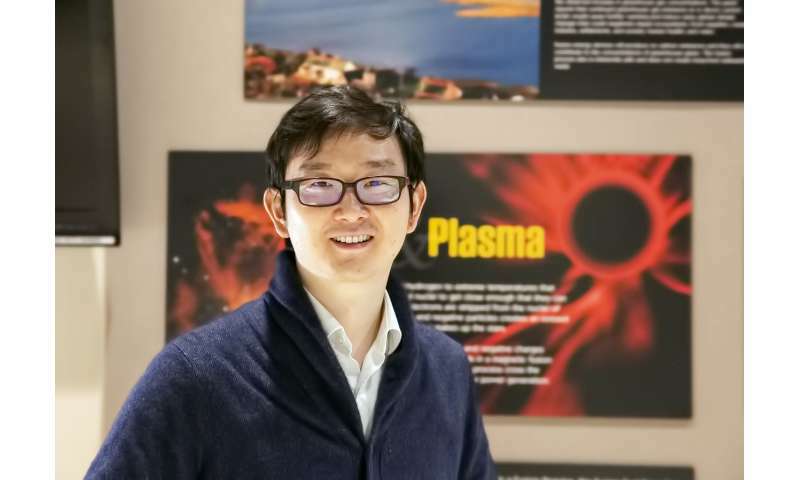 "Until now, no one had investigated by direct numerical simulation how plasmoids can alter the turbulent energy spectrum in a conducting fluid," said physicist Chuanfei Dong of PPPL and the Princeton University Department of Astrophysical Sciences, lead author of the report of the results in Physical Review Letters. "Our simulations show that in a turbulent conducting fluid the formation of magnetic bubbles causes the turbulent eddies to transition from large scales to small scales more efficiently than previously thought." The findings apply not only to the sun, but also to astrophysical objects like accretion disks—clouds of dust and rock that circle dense objects such as black holes and can collapse into stars and planets. "The smallest current sheet size in magnetohydrodynamic turbulence can be smaller than previously predicted," Dong said. "So the current sheets become more intense before they dissipate. As a result, this work can provide some basic understanding of the scales at which coronal heating occurs." Researchers performed their simulations on supercomputers at sites ranging from the National Energy Research Scientific Computing Center, a DOE user facility, to the National Science Foundation's Cheyenne supercomputer at the National Center for Atmospheric Research. Future research could entail expanding the simulation to include three dimensions. "We started in two dimensions, but the real world is 3-D," Dong said. "So what's the picture in 3-D? So far, no one knows."